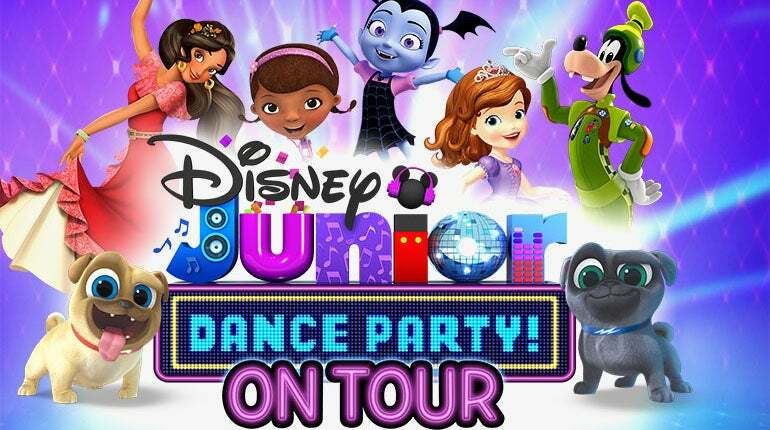 "Disney Junior Dance Party On Tour" Presented by Pull-Ups® is extending its high-energy interactive tour, taking the immersive live concert experience designed for kids and families into some of the biggest markets in the US. With most of the initial dates sold out and second shows being added in multiple markets, the 90-minute concert that brings the beloved characters from the #1 preschool television network’s hit series to life is adding 50 new shows starting in September. The second leg of the tour includes a stop at the Hanover Theatre for the Performing Arts on September 20. Incorporating live appearances by favorite Disney Junior characters Mickey Mouse, Minnie Mouse, Goofy, Elena of Avalor, Sofia the First, Doc McStuffins, interactive on-screen moments with Puppy Dog Pals, The Lion Guard and Muppet Babies, as well as the first-ever live appearance by Vampirina, "Disney Junior Dance Party On Tour" features 20 songs from Disney Junior's hit series, as well as two brand new original songs for the tour. Directed by Amy Tinkham (ABC's "Dancing With The Stars") and produced by Jonathan Shank of Red Light Management, the concert is elevated by state of the art LED technology, a giant Mickey-shaped DJ booth, high-tech scrim screens that transport characters into the theater and 4D special effects.